It may not be an athletic sport, but the Hicksville High School J-Birds robotics team trains and competes just as hard for their games. Led by coach Catherine Temps since the team’s inception in 2004, the J-Birds started with a group of about 25 high school students. Now, the team has grown to include nearly 50 students, and is only seeing an increase in interest from the school community—especially since the team is moving on to the world competition. 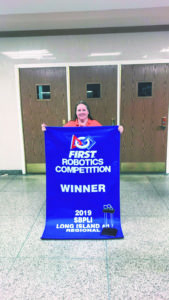 At the end of March, the J-Birds competed in the School-Business Partnerships of Long Island’s (SBPLI) Long Island Regional For Inspiration and Recognition of Science and Technology (FIRST) Robotics Competition at Hofstra University’s David S. Mack Sports and Exhibition Complex. Event number one, featuring 37 teams, was held Wednesday, March 26, and event number two, with 48 teams, was held Saturday, March 30. While the team has competed in the regional competition each year since the J-Birds originally came together, this year they’ve won at the regional level and have earned their spot at the FIRST World Festival in Detroit. 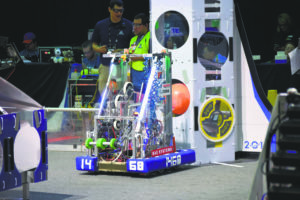 During the regional competition, the J-Birds had to construct a robot to compete in this year’s theme, Destination: Deep Space, Presented by The Boeing Company. The match saw teams battle head to head collecting “samples” on Planet Primus. In two minutes and 30 seconds, teams had to gather as many “cargo pods” as possible and prepare their “spaceships” before the next “sandstorm” arrived. 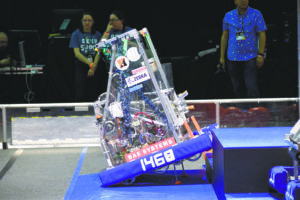 As the battle between robotics teams began, a sandstorm arrived—a screen was put in place to block teams’ view of their robot—forcing robots to either independently follow preprogrammed instructions or be operated by the team through a camera. 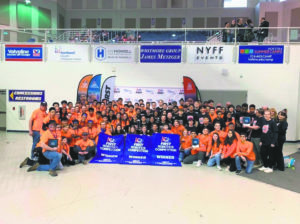 Points were awarded by the teams’ ability to deploy their robots, prepare rockets and a cargo ship with hatch panels and load cargo pods into the rockets and cargo ship. The 15-second sandstorm period then cleared and teams took back full, visible control of their robots. More points were awarded by preparing the rockets and cargo ship with hatch panels, loading more cargo pods and finally, returning the robot safely to its starting point. The team who earned the most points at the end of the match was declared winner of that match. The robotics season is a short one; the team learns the competition theme in January, constructs their robot and by mid-February have a finished product. Once the robot is complete, the team is not allowed to modify it until the competition, which is usually held in late March or early April. Despite having just six weeks to ready their bot, the J-Birds pulled it off and made a successful product ready to take on the world competition in Detroit at the end of this month.